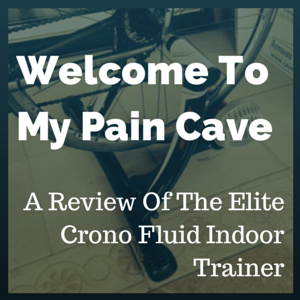 I’ve owned my Elite Crono Fluid Elastogel turbo trainer for over a year. 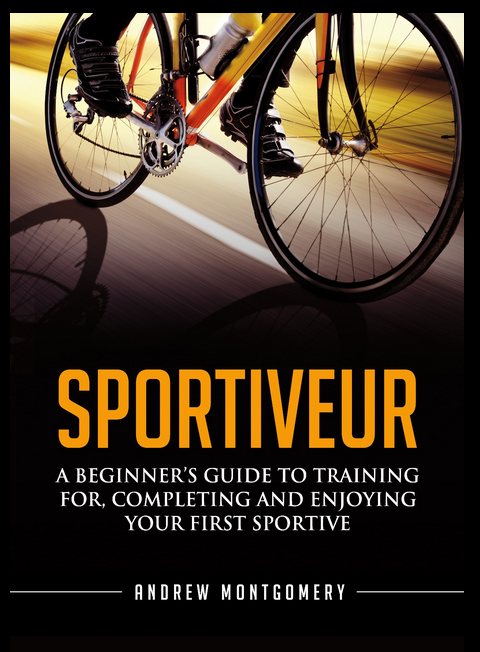 I’ve used it to prepare for RideLondon, to attempt to maintain some semblance of fitness over the winter (hashtag fail) and to complete the 30 Days of Cycling Challenge in June. To be honest, at the moment, I’m on it most evenings. In this post I’m going to attempt to give you a flavour of what it’s like to use and whether I consider it a worthwhile purchase (although, disclaimer alert, it was given to me for my birthday). Given that it has a rather unwieldy name, from now I’ll shorten it to ‘Crono Fluid’ (which sounds disturbingly biological). Be aware that this trainer model has a variety of similarly-named (but differently-specced) siblings. Make sure you’re clear on which one you want to buy (obviously…). In the 15 months that we’ve been together, I feel that that the Crono Fluid and I have become very intimate. We have spent many a sweaty evening together, whilst the kids are in bed upstairs and my wife is at work. I won’t lie, she (the turbo, not my wife) has caused me not a little pain*. Is this relevant to the review? Probably not. I just wanted to get it off my chest. Quickly, for those who are unsure, a turbo trainer is a smallish contraption that you fit to the rear wheel of your bike which lifts said wheel off the floor and puts it onto a roller. This allows you to ride the bike without going anywhere. As you pedal to turn the wheels, the roller spins. The roller offers varying amounts of resistance to being turned, enabling you to get a sweat on. You sometimes hear them called indoor trainers. But I have seen them being used outside. Hell, I’ve done it myself. So there’s a paradox for you. The interesting thing about turbo trainers is the technology they use to create the roller resistance and how the different levels of resistance are controlled. Yes, I said ‘interesting thing’ and I stand by that. The Crono Fluid creates resistance by having the rotor submerged in oil (that’s the ‘fluid’ bit, in case it wasn’t clear). As a result (and don’t ask me how exactly), the resistance on the roller increases gradually and automatically as you attempt to turn it more quickly. What this means in practice is that you can increase the resistance, and the intensity of effort that you’re putting in, by shifting up the gears. Want things to get easier? Simply click down to a lower gear. I’ve found the fluid resistance makes for a realistic riding experience. It feels rights, which is more than you can say for a lot of exercise bikes found in the gym. Since the purpose of the trainer is to make you a better rider on the road (I’m assuming you’re not aiming to become a world class turbo wrangler), the closer to ‘real life’, the better. Changing the resistance level using your gears also feels natural. You’re not having to reach for another controller. If you want things to be harder, click into a higher gear and the resistance rises. Even staying within the same gear, pushing a little bit harder makes the Crono Fluid push back at you. It makes for a very simple way to work hard on the bike. Just to complete the picture, the alternative way for a trainer to give you something to pedal against is magnetic resistance. Apparently, magnetic trainers tend to be more noisy. Resistance levels are not controlled by the speed at which the rear wheel spins. Instead, you have to set the level yourself, using a control attached to you handlebars. Magnetic turbos can also be ‘cheated’ (if you’re that way inclined). I don’t want to labour the point, but the fluid system means higher gear = harder effort (simples); the magnetic (and similar) systems introduce another variable (the resistance level). Say you set the resistance on the roller at a nominal ‘hard’ level, you can make your pedalling experience relatively easy by shifting down into your lowest gear. That all said, magnetic turbos can provide greater resistance than fluid ones. If you’re a very powerful rider (which I am not), you may find that the Crono Fluid doesn’t provide quite enough resistance at the top end. If you are in fact Chris Hoy, you may want to go for the Crono Hydro-Mag, which cunningly combines fluid resistance for the road feel and smooth resistance curve and magnetic resistance to provide extra grunt for your (b)all(s) out efforts. The amount of resistance, and how it is controlled, is clearly important. Of equal import is making sure that your rear wheel is adequately secured to the roller. All the resistance in the world won’t help you if your wheel is slipping and effort is being wasted. The Crono Fluid uses the weight of the rider to apply pressure on the rear wheel, pressing it firmly against the roller. The roller itself is covered with ‘elastogel’. For want of a better description, elastogel has a little bit of ‘give’, which avoids the tyre slipping on the roller as you put down a big effort. A potential issue with trainers is that they cause excessive wear on standard road tyres. According to Elite, the elastogel surface to the roller cuts down on this tyre wear. Often people will buy hard-wearing turbo-specific tyres for their static training needs. I haven’t (yet), mainly because I haven’t noticed particular wear and tear on my tyres. The turbo is not (to the naked eye at least) surrounded by little fragments of rubber. Fitting your bike into the Crono Fluid is very straightforward. First you need to replace the skewer on your rear wheel (i.e. the spindle that goes through the axle, attaching the wheel to the frame), with a specific quick release version (it comes with the turbo and acts like almost every other quick release skewer available). With this done, you place the bike with the rear wheel on the roller, and move up the arms of the trainer such that the ends are in line with the skewer. You then screw in the handle such that the ‘cups’ on the end of each arm move in to hold each end of the skewer, locking the wheel into the turbo. Anyway, long story short: it’s pretty straightforward. That said, if you can, I would recommend having a bike permanently attached into the turbo. Avoiding even a little bit of hassle in setting up before your turbo session can make the difference between doing it and sacking it off as a bad job. But that’s a story for another post. 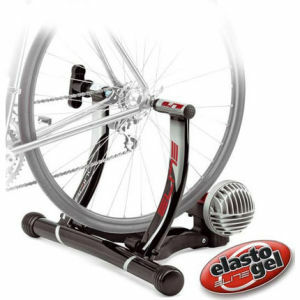 If you don’t have a turbo trainer already, the Elite Crono Fluid Elastogel is an effective training tool at a good price. It’s easy to set up and to use. It feels ‘good’ to ride – that is, it feels sufficiently similar to riding on a road for it not to be a distraction. There are other (more expensive) trainers available which connect to computers and tablets, allowing you to simulate famous routes and climbs. These are primarily to help alleviate the boredom inherent in spending 45 – 90 minutes staring at the same piece of wall. If you can think of other ways to entertain the mind (I listen to podcasts; you can listen to music si vous voulez), the Crono Fluid is just as effective as more expensive machines in building your fitness. If you’d like to find out more, or you want to buy one, the Crono Fluid is available from these fine establishments. Thanks, Monty, for that well-timed post. I’m in the market for one of these instruments of torture and the ‘Chrono Fluid’ might be just the job. As a fair weather cyclist and winter just around the corner, I need something to stop me wimping out of a ride! Nice post especially with it being chilly here this morning and winter not far away . . .
? 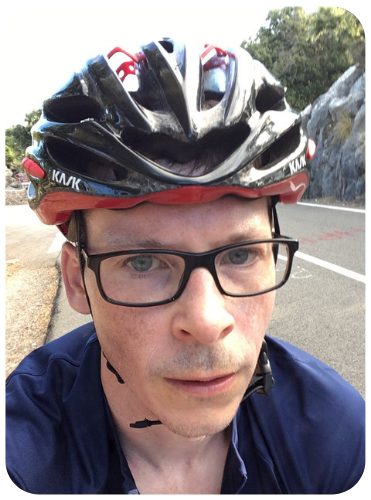 I’ve read trainers can be hard on the bike – have you found this to be the case? Went to Amazon and found fluid/mag but not your model – do they still make it? Re: availability – yes, I think I’m reviewing a trainer that’s been around for 3-5 years. I found it available in the UK, but not so much in the US. I’m guessing the hydro/mag version is probably better and it’s not much more expensive. I think the equivalent current range of Elite trainers might be the ones with the word ‘Qubo’ in their name. I just wanted to say I love your blog. I have the same trainer and think it is great, I live in an apartment and regularly use it before work and it’s so quiet that I do not need to worry about annoying the neighbours. I use a computer programme called trainer Road which monitors your workout and has training plans which I highly recommend. It makes sure that you put the effort in on three trainer! I also use the sufferfest cycling videos which make turbo workout a lot harder and more interesting! Thanks Paul. I’ve been looking at Trainer Road. In fact they emailed last week to see if I’d like to try it out. I’m particularly keen to see if it provides me with some quasi-power data, based on my speed and the ‘power profile’ of my turbo. Just need to set up a computer near by I suppose (and work out how to protect it from sweat….). I’m looking at a turbo at the moment for a couple of reasons, but mostly the weather that’s coming. I was alerted to this the other day and this is another reason to get a turbo trainer. I’m not in the beta at the moment but they had 10,000 people sign up in just 3 days. I think this might be a good subject for one of your reviews in the near future. This appears to be some form of gamification around turbo trainers. Linking users with a turbo and Internet connection to friends to make the ride/training less boring. If this works then I’m all for it. Can’t wait to try it out. I have an Elite Super Chrono trainer too (I am not sure off the top of my head if it’s a fluid or a mag one). Since I have had it, I’ve really struggled to get one with it. Some of my issues have just been getting comfortable with it. I find that there is a little bit of side to side movement in the back wheel.When affixing the bike I am satisfied the wheel is locked in securely but when I start pedalling there is still movement. I don’t use a front wheel block. Is this normal? and if not do you think it would be remedied by use of said riser block? I have the elite skewer fitted and have fiddled with the locking mechanism at the back but it doesn’t seem to make a great deal of difference. I’m not sure whether the front wheel block will stop the movement at the back, but you might find it makes the ride more comfortable. With nothing propping up your front wheel, you’re sort of riding downhill and I’ve found that this slides me forward, makes me put more weight on my hands/arms and shoulders, and is generally uncomfortable. As to the movement at the back, I think I do have a little side to movement, but it’s more that I see it on the roller rather than feel it as a lack of stability. It’s difficult to know whether what you’re experiencing is normal, or whether there is something wrong with it. Have you tried contacting Elite (or whoever you bought it from)? Sorry not to be more use…. Hello, love the blog. I’m considering getting one of these trainers however was conserned about the lack of adjustable resistance. How would you describe the resistance in the hardest gearing? A stand up struggle or just a bit harder. I’m a regular guy but want to work on getting up hills quicker through the winter. I’m concerned the hydromag version will be noisier, which is an issue. Hi Darren. Glad you like the blog. I’ve never got near topping out the resistance, so I can’t really say. I’m not the most powerful of riders though. I would say that for fixed turbos like this, you don’t really get out of the saddle (I haven’t tried in a while, but I’ve a feeling they’re a lot less stable than, say, a gym spinning bike, where you do the standing up thing). The joy of a turbo is that it really focuses on developing your sitting down power (which will get you up the hills quicker anyway). Also, for hills, you’re not going to spend much time in training kicking out a Chris Hoy style 1500 watts. It’s more about improving your muscular endurance and pushing up your power (or speed) at threshold (the level you sustain for ~30 minutes). The max limit of resistance on this trainer certainly won’t stop you doing that. This review on Wiggle shows the power curves for the Hydromag at its 5 different settings and suggests that the Elastogel version of the trainer is the same as the middle one (and therefore tops out above 900W). Great post- very good summary. I have one of these trainers, and it really helped with my preparation for an Alpine tour. The resistance curve is realistic; for example, my 1/2 hour best average speed on the turbo was very similar to what I achieved in a 10m time trial. Its very good for hill training; there is ample resistance to simulate the sort of long steady seated effort you will require for an Alpine col, or even the shorter punchier seated assaults on short sharp UK hills. Another useful factor is the gentle whine it makes (it, not me!) as this help me to pedal smoothly, aiming for a steady ‘note’, consistent with each leg stroke. The only thing it won’t do is out of the saddle sprint efforts as it relies on your weight to push the back wheel onto the roller, but IMO they are not good for a bike frame on a turbo anyway. A tip though- if you care about such things, watch the rear derailleur as you fit the bike to the turbo- its easy to scratch and chip on the Turbo clamp. Thanks PRSboy. Good tip on the rear derailleur. on the web site, it says you can couple it with software to enhance your ride (I think you do courses etc) …..any ideas? Do you need to buy something to sync with it?